War. War never changes. In the 21st century people still battled for the few resources that could be scrounged. In this time the resources were also weapons: Petroleum and Uranium. In the search of these resources China would ultimately invade Alaska, The United States would annex to Canada and the European Union would dissolve and turn into a bunch of warring countries foolishly focused in controlling the few remaining resources that could be found on the planet. In the year 2077 the storm of war was once more awakened. In barely a couple of hours most of the world turned into ashes… and from the ashes of the nuclear devastation new tribes, cultures and civilizations began to emerge. When the atomic fire engulfed the lost earth it devoured the souls of most of humanity upon its wake. The majority of the humans who survived did it in the Pre-War vaults constructed underground by Vault-Tec. Even before the war the Islands of Hawaii were a place where the population and society was tense and worried. The prices of fuel were at an all time high and every day they became higher, riots formed almost on a daily basis and whenever they appeared citizens and government clashed. Due to the high amount of Asian people living on the Islands and the mixed fear of Chinese espionage and nuclear war looming over a sense of terror and paranoia began to rise up in people, fear that ultimately became violently fueled by racism. Eventually most if not all of the Asians were either killed or imprisoned in internment camps, where to all legal means they ceased to be citizens and humans, and became subjects of experimentation. Due to its closeness to Asia and the Communist China, Hawaii became one of the most militarized areas of the United States. Here scientists and military troops trained and tested the new technologies that were to be used in enemy territory. Whereas China specialized in infiltration and stealth technology the United States worked hard in designing Power-Armor, suits of metal that turned regular soldiers in walking tanks. To detect the nearly invisible Chinese submarines, hundreds of Satellite and Radar Antenna stations were built and to satisfy the high energy need that all the antennas and new technologies required Nuclear Energy Plants were built a all across the islands and even in submarine or floating stations. Ultimately all that became moot, for all that it did was delay the inevitable. The 23rd of October of 2077 the nuclear apocalypse happened. Many American citizens didn’t run away when they heard the sirens as they thought that it simply was another training exercise. The Vaults closed their doors as the world burned engulfed in atomic fire. A few people managed to take shelter where they could; caverns, sewers, basements… most of those who didn’t couldn’t take cover perished in the nuclear exchange. The survivors would ultimately become the basis of new civilizations and cultures. From that moment on humanity would be forever changed, in both a metaphorical and literal way. Some of the people who were exposed to the radiation didn’t die right away; they became Ghouls, decrepit and immortal humans that look like the rotten zombies of Pre-War movies. Hawaii was one of the first and more affected territories attacked during the Great War against the communist China. As the principal focal point of military forces projected against Asia the islands were quickly subjected to a great nuclear barrage done by both massive bombers and intercontinental missiles. 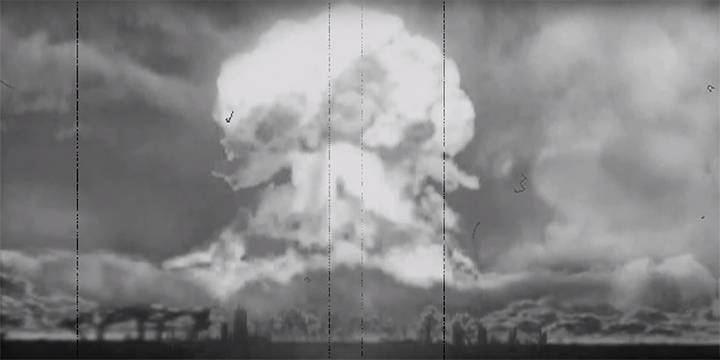 The impacts and radiation were devastating but it wasn’t until contact with the rest of the United States was lost that the true scale of the attack was revealed to the local population. With the fall of the bombs came the Great Blackout, a wave of electromagnetic energy that disabled most if not everything that possessed an electronic circuit, including robots and vehicles. Luckily there were several boats sailing the ocean as the catastrophe happened, as they were away from the bombs they weren’t affected by the electromagnetic pulse and the radioactive storms that formed thereafter, when things calmed down several of these ships returned to the coast, allowing people to travel and form routes of mercantile trade. During the following weeks after the bombardment several riots broke out as people died from starvation. In an instant what once was the home of more than a million people became a wasteland inhabited by barely a thousand survivors that somehow managed to survive and prosper in the destroyed ruins of what once was paradise. Military command disappeared, the countries all those soldiers fought for had ceased to exist and became little more than a faint memory. A few Chinese and American soldiers started a ceasefire and decided to settle upon the different islands decided to work and build together a new beginning. Still not everybody was able to leave their past behind and even years after the bombs fell several gunfights between Chinese and American soldiers happened. Regardless of what they decided to do most of the soldiers that survived became scarred by the war and ended turning into raiders or pirates, attacking everybody that crossed their paths be it by land or sea. As years passed by the Hawaiian Wasteland started to stabilize. From the ashes of the old world new settlements and societies formed. Two hundred and fifty years have now passed since the Great War. The entire island of Oahu is now under control of the nation of Ohana. Several of the islands are now settled by violent raiders, strict mercenaries, the Brotherhood of Steel or independent wastelanders that simply want to be left alone. The journey that you’ll take might lead you to a premature death or the biggest or glories. Become a great hero and fight to defend your ideals or turn into a psychopath and continue with the cycle of violence and death that initiated with the Great War.